Soon, the European Roma Institute for Arts and Culture will be established in a major European city yet to be revealed. It’s time to look to us for guidance, solutions, and inspiration. 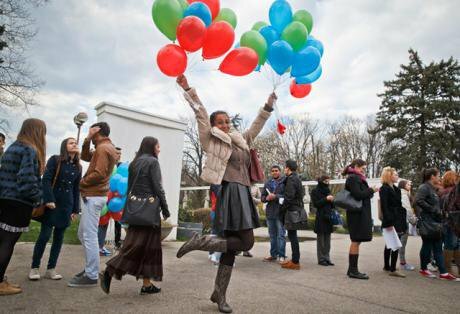 A girl with balloons in Roma flag colours, International Day of the Roma, Bucharest 2015. AP/V. Ghirda. All rights reserved.Terrorism. Sprawling camps for displaced people. Concrete walls and barbed-wire fences. Today, Europeans confront a range of humanitarian and security crises; Romani people have long experience facing these conditions. In past decades, Europe’s 12 million Roma have been pursued by neo-Nazi mobs in the Czech Republic, murdered by right-wing terrorists in Hungary, and forcibly removed from homes in France, Bulgaria, and Italy by politicians who scapegoat them in pursuit of votes. Last month, a Slovak neo-Nazi party that organized marches against the Roma minority won 14 seats in the 150-strong Parliament. Recently, large numbers of Syrian refugees have captivated the public’s attention; meanwhile, thousands of stateless Roma have been living in miserable camps in Italy for nearly four decades after fleeing post-Tito Yugoslavia in the 1980s and the Bosnian war in the 1990s. And yet, despite this reality, it is Europe that seems to be on the verge of disintegration, while Romani people from across the continent – and the world – are reclaiming their sense of history and belonging. In a new stage in their struggle for recognition and self-definition, Romani academics, public intellectuals, and civil society leaders are gathering together to build a community based on shared accomplishments rather than endured oppression. That effort is beginning to show tangible results: soon, the European Roma Institute for Arts and Culture will be established in a major European city yet to be revealed. This achievement is an extraordinary form of resilience, and, as Europeans collectively struggle against a range of trends that threaten their very existence – rising nationalism and xenophobia, failed migration policies and the closing of previously open borders – we Roma have valuable lessons to share. We have been organizing across generations and borders. Without resorting to violence or reclaiming a nation, we came up with a simple claim: our place is in the centre of European societies. This work began in earnest forty-five years ago this month, when Romani artists and activists from across Europe gathered near London for the first World Romani Congress to discuss their common identity. They would no longer be called “Gypsy”, a term often used pejoratively, but “Roma”, which means “people” in the Romani language. “Gelem, Gelem” was made the international Romani anthem, the blue and green flag with the red wheel was chosen as the official Romani flag, and April 8 became an international day of celebration for Europe’s largest ethnic minority. The European Roma Institute for Arts and Culture is a major culminating point of these efforts. Out of more than 10,000 works by Roma artists in public collections throughout Europe, only two are in permanent exhibitions. This Institute will allow us to shape our own voice and image and to reclaim our arts and culture. Europeans would do better to similarly embrace their commonality and successes instead of dwelling on divisions and grievances. Roma have been constantly labelled a ‘problem’. Recently, Europe is more and more discussed as an ‘issue’. We Roma are proving that we can be the answer, not the problem. It would be tragic if the European experiment failed just as we are finding our place within it. It’s time to look to us for guidance, solutions, and inspiration. The prominent Romanian Roma activist Nicolae Gheorghe once said that “the relationship with Roma in each society should serve as a kind of 'barometer' measuring the state of democracy.” In his view, the Romani people are a sort of mirror, reflecting the truth about how Europe deals with its past, its present, and its future. If that’s the case, the prognosis has never been better. The Roma can be a beacon of hope – a shift in momentum away from fear and hatred and toward a more open and inclusive Europe.